When I think back to my childhood, I remember running. Someone once said to me it means that I was probably running away from something… then someone else also said that it means I was running towards something. In the end, who knows? Sometimes here in Toronto I am in my car driving somewhere and I see people running on the street. It does not matter how I am feeling at the time; good, bad or great. I ALWAYS wish I was out there running. Your grandma is my biggest critic. She says I need to lose ten kilograms. That is my goal. For now that is my target. I am going to run every Saturday morning. If I have a busy weekend, I am going to run really really early. 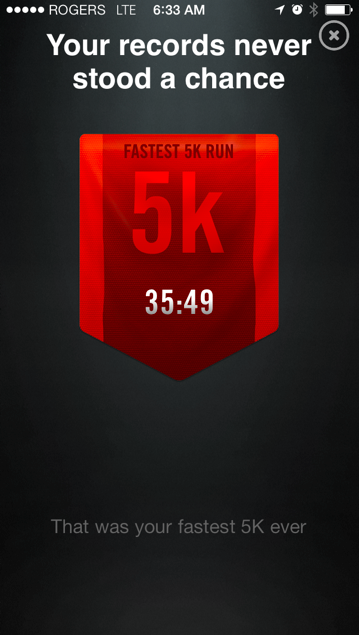 If I don’t post a screenshot of my run, it means I am failing. Call it an extra dose of inspiration. Am I going to be a failure in front of my kid? No way! Just like I did with the first two steps… I spent some money to make sure I keep at it. I went to a store for runners next to Royal York Station. I bought the special shoes, the fancy reflective clothes to run in the dark, a headband and a belt with four water bottles. Your mom is being super cool about it. She knows I am investing in our future. When I say our future, I mean yours as well. I ran 8.46Km in 1:09:16. I am going to do better next Saturday morning. 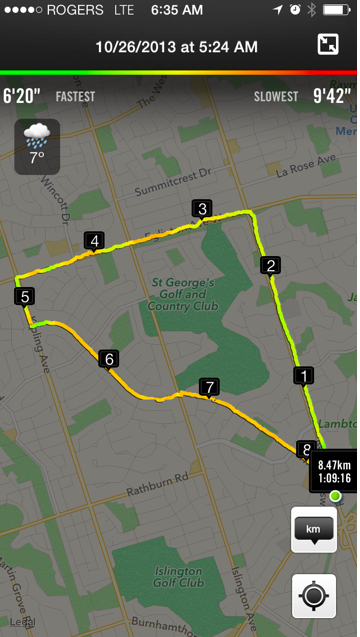 I am going to turn right just before the 5k mark and go around to try and make the total run around 10 Kilometres. Besides the weight loss I also set another target: 10K in under one hour. You may notice that the last leg of my run was through the mansions at The Kingsway. That was by design. It is 7:30AM. I am going to wake up your mom. I bought a loaf of high fibre bread at Cobs. We have a busy day. Your grandma’s birthday is tomorrow but we are going to celebrate tonight.